Jason Spencer and his family [including yours truly] will hold a fundraising event this Saturday, beginning at 2 PM, to raise funds to help him deal with the legal expenses associated with his fight to defend his rights as a father and to ensure that his daughter, Kaliska, will continue to be able to call Coupland her home. There will be a silent auction and a raffle. Attendees can buy barbecue plates and drinks and listen to live music. Many Couplanders are familiar with the situation but for those who don’t know, Jason was a stay-at-home dad, a choice made by both parents, and was Kaliska’s primary caregiver for the first 2 years and 3 months of his daughter’s life. Early in 2012, the family moved from San Marcos to Coupland to establish a multi-generational, rural homestead that was close to job opportunities for Kaliska’s mother, who was teaching in Round Rock at the time. Jason is also a musician who plays the upright bass along with its electric cousin. A few of his musician friends will be here to entertain attendees. Jason’s love of art and music are combined in his latest piece, seen below. 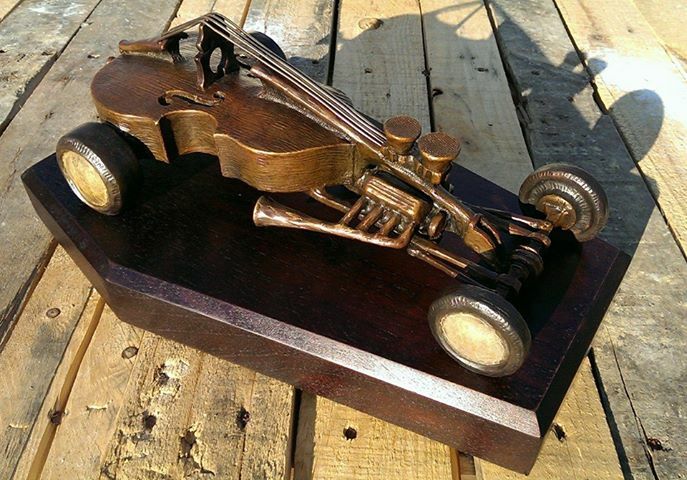 The Bassmobile: bronze on wood. He had planned to establish a full workshop so he could beginning producing new pieces and promote his products but Mom left a year ago this month, about 6 months after the move, and took Kaliska with her. Plans had be put on hold to deal with the changed situation. Jason now works at Omega Bronze Art Foundry in Smithville. He also works from time to time with Wells Mason, of Ironwood Industries, right here in Coupland. In fact, a few of his pieces will be included in an art show taking place the night before at the Wells Mason Gallery as part of the East Austin Studio Tour. Reception starts at 7 PM. Jason wanted to avoid a legal fight but the alternative was to be relegated to the status of an occasional father. For the past year, Mom and Dad have had more 0r less equal time with Kaliska, thanks to a temporary court order. Kaliska loves her home in Coupland and has many friends, both young and old. She helps with the chickens and the garden and wants to learn how to ride horses. At three years old, she will have to wait a while but she is already talking about how Daddy will have a big horse and she will have a small horse and they will go to the bank for a lollipop, and then to the Post Office, and then to visit her friend Sophia-Rae. Jason would like to make that dream come true. You can help him do that and have fun at the same time! This entry was posted in Social, What's New? 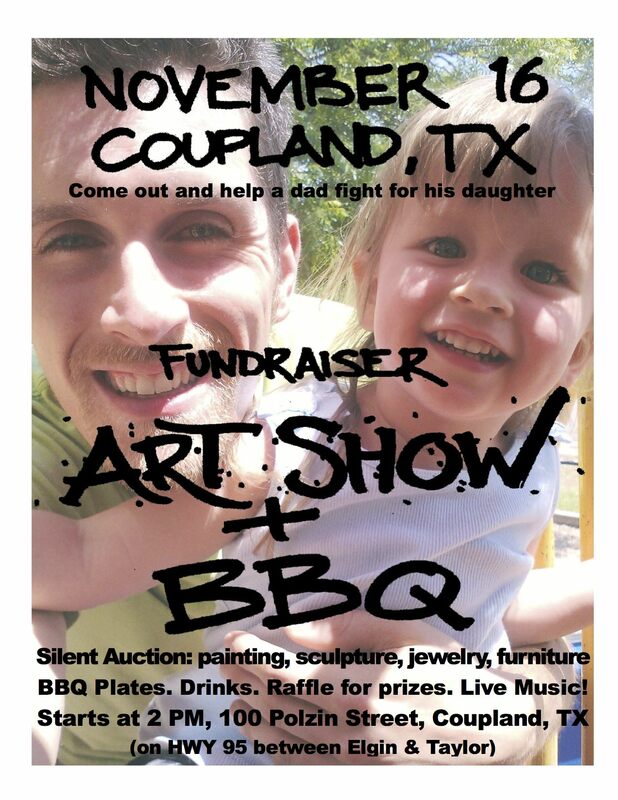 and tagged Art Show & BBQ, Coupland Texas, fundraiser, Jason Spencer on November 12, 2013 by Stewart Dale Spencer. It’s gonna be a blast, come get some bbq, stay for some music and art. Thanks everybody!